Martin Lawrence snapped a lovely photo of BRPS Chairman Graham Aitken and a large crowd during the 60th Anniversary of Line Closure events, 16-18 March, 2018. The last few weeks have been extremely wet, and this has prevented any further work on embankment stabilisation, or removal of the spoil heap. However, the last week of March has seen some progress on the movement of stock. On 29 March, 2018, the temporary track was slewed across to G road, and six vehicles were shunted across the running line from the Ardingly sidings into the shed, all without mishap. On 3 April a seventh vehicle was shunted into the shed, filling G road. The ground on the south east corner of the shed is unstable, so no further carriages can be shunted into the remaining two roads (H and J) until a significant proportion of the embankment work has been completed and the ground stabilised. Over the next few days the temporary track linking the head-shunt to the shed will be lifted to allow the earthworks to be started as soon as weather conditions permit. In the meantime, work is progressing well on the detailed design of the Heritage Skills Centre. Completion of the design will provide details of finished ground levels to the east of the building and, crucially, enable the northern and eastern wall cladding to be specified and detailed. The work is being entirely funded by donations, and a further £150,000 is now required to complete the brickwork and cladding of the northern and eastern wall, which will provide additional weather proofing for the carriages and also provide extra security, screening the vehicles from the road. If you would like to support this much-needed project, please visit the OP4 MyDonate page . Infrastructure Update: Half Empty or Half Full?! Another milestone was reached this week with the second road (G) now completely filled up in OP4. The Infrastructure Team has been busy since the relaying at Holywell, moving the access road across from F road which is almost now like a bit of "Flexitrack". It wouldn't stand scrutiny on the main line, despite originating there, but it is more than adequate for very slow stock movements. The track is now being taken apart again, but it can't be used yet for the other two roads because there is a large pile of earth in the way. That earth in due course will be used as fill for the new roadway by the side of OP4 to link the Salt Yard with the new offices, but for further movements, the access point will have to be further back on the new headshunt, which has yet to be completed. Unlike your average train set, where curves are unnaturally sharp, there is still a limit to what is achievable when you are modelling in full scale, and we are about at the point where an even tighter curve might cause wheels to fall off on the dirt while we are pushing stock in! Apart from that, work is still underway in the triangle at Horsted Keynes to break down the panels from the recent relaying, and tamping is going on as well at various places in between the scheduled services that have now started for the season. While on the subject of track, you might have heard that we have another Track Trek taking place on the 30 June, 2018. If you are excited by the prospect of being legally lineside before then, well you don't have to wait. Why not join the Infrastructure Team as a volunteer, where you will be warmly welcomed?! There are always plenty of things to do and many different working situations where you can use your skills or learn new ones. Just have a look at our Infrastructure Volunteer page for further details. The end doors ready to fit. The grit blasting on CCT van S2531 has been completed and the vehicle re-entered the shed in the middle of February. The entire frame has now had a coat of rust treatment, followed by a coat of red Bonda primer. The midweek gang are now giving the van the first coat of undercoat. On the roof, the final small roof boards have been fixed (those immediately above the side doors needed replacing and were left off while the vehicle was outside). The roof is now being prepared for re-canvassing, which it is hoped will take place if we get some warmer weather in May, the bedding compound being more manageable when it's warm. Chris Broadbridge continues work on the doors, and we now have two complete sets of end doors and the first pair of side doors ready for trial fitting in due course. Tom Simcock and Toby Staddon have continued dismantling the brake gear for overhaul. The south end of the van. A minor setback has been the decision that the drawgear will need to be dismantled for overhaul, which requires us to lift the centre rail for the floor. This work will delay our ability to start replacing the floor, which needs to be done before we can start replacing the sides. Hopefully, the delay will not be too long. Meanwhile both the north end buffers have been removed, the wooden packing pieces replaced, and the buffers cleaned up and re-fitted. Work has now moved onto the south east corner buffer; we can only remove one buffer at a time in case there is a need to move the vehicle as it is expected that Car 54 will be moving back into the shed shortly. Roy Peters continues his labour of love repairing the inside "strap beams," a task that must feel like painting the Forth Bridge, for no sooner does he complete one, then another appears from the stores (note to Roy: there are only 24 of them, honest). Amazon is offering a fundraising service for registered charities through Amazon Smile. When you purchase eligible items via smile.amazon.co.uk (instead of the Amazon's ordinary website), Amazon will pay 0.5% of the purchase (excluding delivery and VAT) to a charity you nominate. The prices and products are exactly the same as the ordinary Amazon website. I f you like buying things on Amazon, please consider using Smile and nominate the Bluebell Railway Trust . Better yet, encourage your friends and family to do the same--every little bit counts! As part of this years' Bluebell Railway Preservation Society Annual General Meeting (AGM) on 19 May, 2018, we will be putting together a presentation of video footage and photographs depicting all aspects across the Railway over the last 12 months. We welcome contributions from anyone. Please send video footage or/and stills photography (colour or black and white) reflecting any aspect of the Railway--locos and trains, people, events, engineering--shot between 1 March, 2017, and 29 April, 2018. Selected contributions will be edited into a film montage to be shown at the AGM. Video contributions need not be edited (i.e., selected random "shot rushes" are entirely acceptable) and can be submitted in any of the standard proprietary formats. Still photographs ideally should be submitted in their original resolution (the higher the resolution, the better) as a JPG file or similar. Authors of selected contributions will receive full credit in the closing credits, and the copyright of any used contributions will remain with the owner. All submissions should be sent to filming@bluebell-railway.co.uk to arrive no later than 29 April. All submissions will be reviewed as soon as received. Because of the expected size of video and photographic files, we suggest that you use WeTransfer.com . This service allows up to 2 GB of files (in any or multiple file formats) to be sent free of charge. Dave Clarke's photo shows No. 2159 arriving at Horsted Keynes following recovery from a bungalow in Pagham. Late last year two South Eastern Railway (SER) third class carriages were recovered from a property at Pagham, West Sussex. The first coach is a six-compartment, 33-feet-long, eight-wheeled third built in November 1887. The second coach is a very unusual 30-feet-long, four-compartment brake third with a central brake compartment and raised birdcage lookout. We believe this second carriage to be one of only four examples, built in 1877-1878 (nos. 1887-90). It has yet to be positively identified. They were later converted in 1906 to two-compartment luggage brakes, with short buffers for close coupling at the non-van end. All four were later allocated to 14-coach sets for use in workmen's trains. Both coaches were withdrawn from service in 1926 (before receiving their SR numbers) and sold without their wheels and underframes to become part of a bungalow in Pagham. Their structures are made of teak, and they are considered to be eminently restorable. However, there are no plans at present to do more than conserve the bodies for restoration at a future date. The Railway now has the only SER guard's brake vehicle in preservation, and we would envisage it would be rebuilt back to its original condition with two passenger compartments on each side of the guard's van. SER carriages are extremely rare in preservation, but the Railway now has a substantial collection of such vehicles. We also have a first-class saloon (No. 172) and the Gilbert Car (No. 33, later named "Constance"), plus the odd "100-seater" No. 1050, rebuilt in 1924 from former SER carriage bodies as a prototype for third rail electric stock but only ever steam-hauled. The two new carriages provide much-needed additional third class accommodation for the planned train of LCDR/SER Victorian carriages, for which we already have three restored vehicles of London, Chatham, and Dover Railway (LCDR) origin. These are brake No. 114; semi-saloon conversion No. 3360; and full third No. 3188, along with brake third No 48 (SECR No 2781), which await restoration. The intention is to present the train in Edwardian SECR livery to match our SECR steam locos. As home to six of the eight surviving SECR locomotives, such a set of carriages is of huge importance to us. The Diesel Gala (23-25 March, 2018) didn't quite go to plan, unfortunately. Firstly, No. 45041 failed on Friday with a defective triple pump. It was repaired that evening, thanks to the Spa Valley Railway, which provided the spare part (a plastic gear wheel for the triple pump). This loco ran for the remainder of the weekend, until late Sunday afternoon when it failed again between Kingscote and East Grinstead, travelling in the Up direction. It was rescued by our own D4106 "Thunderbird". My own personal experience on Sunday, on Set A, was that I expected to have D182 as my motive power but I was somewhat surprised to find D182 at the south end of my train in the pumphouse siding at Sheffield Park. I was even more surprised to find S15 No. 847 backing on to the north end of my train. I was informed that this was my motive power, at least for the first round trip! This trip completed successfully, upon arrival back at Sheffield Park, my motive power was now to be D4106 with my set being reduced from six to four coaches. Nos. 45041 and 31271 seemed to be performing well. As we travelled back on the final trip from East Grinstead to Sheffield Park, and having passed No. 45041 at Kingscote, we got word approaching Horsted Keynes that No. 45041 had failed once again. "Thunderbird" would be required once to again to rescue it. My train being terminated at Horsted Keynes for the present, and my loco being commandeered to rescue No. 45041, passengers on my train--around 35 or so--took it all in good spirit, which other members of staff told me was a sentiment repeated at other locations. Passengers seemed generally interested in the various rescue operations being undertaken and the unusual movements! My train was rescued once again by S15, which took us to Sheffield Park, arriving some 55 minutes late, followed later by No. 31271 and its stock, then finally D4106 and the stock of No. 45041. This loco remained in the siding at Kingscote until its return north to East Grinstead with D182 and No. 31271 on Sunday evening, ready for collection on Monday morning. Thanks go to Chris Knibbs and Chris Haynes for sorting out the various issues throughout the three days, and thanks also to Paul Russell for organising the event. Thanks also to all members of staff who worked over the entire gala. Some put in long hours to get services back to normal for the following traffic day. By Mike Ellis, Operations Director. CORRECTION: In the last issue, Russell Pearce was incorrectly identified as Operations Director. Russell, in fact, stepped down from this position last year, and the new director is Mike Ellis. Trekking Again for the Track! After two years of offering a full-line Track Trek during the annual November engineering shutdown period--when those participating have experienced a real mixed bag of weather--we have decided to organise a mid-summer's evening Trek over the south end of the line. The evening of 30 June, 2018, has been set for a five-mile Track Trek between Horsted Keynes and Sheffield Park. With the Railway's major fundraising appeal still being the Tr(ack) Action Appeal, we've decided that all sponsorship money raised from the Trek will go towards purchasing more replacement track panels. The Track Trek will start from Horsted Keynes with registration and safety briefings taking place between 5 and 6 p.m., with the walk starting at 6 p.m. once a possession of the Sheffield Park to Horsted Keynes section of line has been taken. Trekkers can park their cars at Horsted Keynes to start the walk, or alternatively you can use the Railway's train service from East Grinstead or Sheffield Park to arrive at Horsted Keynes in time to start the walk. From Sheffield Park, walkers should catch the 5:15 p.m. train and from East Grinstead the 5 p.m. departure. A special evening train service after the Trek has finished will take walkers back to Horsted Keynes and East Grinstead stations. Last year we had more than 200 people take part, despite the damp conditions. We hope many people will take this opportunity to walk part of the line on, hopefully, a warm and dry summer's evening, raising lots of sponsorship money! The minimum expected sponsorship value is £20 per person and £35 for a couple or family (two adults and three children aged between 10 and 16 years). All trekkers will receive a certificate after completing the Trek, and those who raise more than £100 in sponsorship will receive a commemorative medal. You can create your own page at BTs MyDonate . For more details and to download a sponsorship form, visit this webpage . The Track Trek team look forward to seeing you all in June! The Q1 with a demonstration goods train in 1980. An oft overlooked point about Heritage Railways is that, back in the day, the railways were by and large almost entirely constructed for the movement of goods, especially coal and mainly in the north of England. Generally, railways went where the canals had gone before and for the same purpose. Outside of the industrial areas, where landowners reliant on agriculture realised that they could benefit from faster transport to get goods to market, and especially to London, the web spread its fronds to many an idyllic rural setting. That is why our line was built. Ashley Smith's video of a demonstration goods train from 2 April, 2018, pulled by No. 65. Another often unremarked feature is that braking systems on these early railways were primitive, and, in the beginning, no better than those used on stage-coaches. Gradually as speeds improved and trains got heavier, engines were provided first with more powerful hand brakes (often on tenders only), then "brake vans" were provided also with a powerful hand brake. The digitisation of both census and Railway employment records make it quite easy to track the careers of railway staff. Here we look at the very early days at Kingscote. We get a tantalising glimpse of the new station starting to take shape in April 1881 when that year's census records that the station was occupied by John Robinson, a civil engineer (aged 48 born in Kendal, Westmoreland); his wife Emily, aged 47 (born in Hadleigh, Suffolk); their son Richard aged 23, also described as a civil engineer. Also, Alfred D Ackland (aged 22) is described as a "visitor"; his occupation is also given as a civil engineer. (The census tells us that he was born in Oxford.) They had two servants both 15 years of age; Grace Anscombe from Battersea and Edith Buckwell from Barcombe. The last issue of the eNewsletter contained a link to a fascinating Pathé News clip entitled "Fire Fighting Engine 1941", "using a Southern Railway 0-6-0 tank that has been fitted with water pumps for fighting railway fires". However, the caption is slightly inaccurate. The loco concerned is no mere common or garden Southern 0-6-0T but a Stroudley 0-4-2T D tank, formerly No. 18 "Stockwell". A D tank was one of the great ambitions of the Bluebell Railway when it was first set up, since this class had been regular performers on the line, and they were, even more than the Terriers, the quintessential Brighton loco. Although British Railways had scrapped all theirs by the early 1950s, "Riddlesdown" had been sold to the Whittingham Railway near Preston in Lancashire. The railway served the Whittingham Mental Asylum, and "Riddlesdown" remained in service until the late 1950s. In late Summer 1959 a letter was sent to inquire whether the loco still remained and could she be salvaged? The answer came in October that she had been scrapped barely a year before. The tale is recorded in the Bluebell News for November 1960, and it is one of many articles which describe the very difficult decisions about locos that should be preserved. Plenty of historic locos were available in those days and at prices that now seem ridiculous. However, the priority for the Society at that time was to secure ownership of the line (and thereby its own long term future) and so it had to watch while worthy candidates for preservation went for scrap. the National Railway Museum. "The man shown is not a guard but apparently a station inspector, giving the right-away to the unseen guard," observes Nick. "Quite apart from the absence of a guard's flag and nearby compartment, the passenger guard's uniform of this period was blue-grey (not mid-grey) and had silver piping, lapel badges, and buttons, with the matching cap having a silver 'double-arrow' badge on a blue oval background." Like and share our new Golden Arrow Facebook page, keeping you apprised of dates for Murder Mystery events, menus for dining trains, and more. Our work so far this year has been to make a great start cleaning the station and getting it ready to repaint the fence line and the lamps. David Turquand and John Kateley have led a team of regulars each week. We also have new signs in place to try and give more "theatre". Station Master Len Harvie made the frames for the outside fence line to hold the new style poster boards and make them easier to install. Writes Tony Hillman: "In Easter 1963 John J. Smith visited Scotland on the 'Scottish Rambler No. 2' railtour. Here are six of his pictures." Full details of the tour can be found here . Taken on 12 April, 1963 (Good Friday), CR123 at Crianlarich Lower. Tim Robbins provides these two archive photos in relation to Project 27: "I thought I might offer a couple of unpublished archive shots of what are now the two working P's: No. 323 is seen pristine in Bluebell Railway livery in April 1969, and No. 178 is found in what I can only describe as 'as received' condition in Autumn 1970." Thank you, Tim! Clive Emsley's photo shows a beautiful, glossy finish applied to No. 27's wheels. "The finish on the wheelset that has been painted over the winter is something incredible and is probably better than the original! All of the dimples that were in the wheels have been filled and rubbed down, giving a first-class base to which the gloss has been applied. A splendid finish and a credit to Matt for the initial work and Jim for the paint finish. A credit for both of them." The Project 27 team will be on the platform at Sheffield Park during the Branch Line weekend, where they will be answering questions and selling marmalade and other items. Also on display will be a collection of the new Hatton's P class models. Brian Lacey's photo shows 01 class No. 65 at Horsted Keynes with the Wealden Rambler Afternoon Tea train on 31 March, 2018. John Sandys (5 April, 2018): "A lovely spring day at the Bluebell Railway with the Q class and H class on the two-train service, plus updates on the ASH project and canopy at Sheffield Park." Martin Lawrence has finished his March 2018 gallery and begun his April gallery . Here we see Alice waving goodbye on the platform. Curiouser and curiouser. NOTE: This will be the only eNewsletter produced in April. It will return with a 13 May, 2018, issue. The Railway has planned an array of family friendly, dining, and other events during the visit of No. 60163 "Tornado", one of the stars of Paddington 2 , from 25-29 May, 2018! * Paddington™ Bear will be on hand to see you all on board at intervals on 28 and 29 May and to help wave the green flag to get you on your way! * On Saturday and Sunday "Tornado" will be hauling our famous dining trains, including the Golden Arrow evening service. * On 26, 28, and 29 May there will be Teddy Bear's Picnic on one of the trains. Reserved seats are available in the Buffet Car, and a picnic tea for children is included in the price. Bring Teddy along too, and your bear will get his or her own ticket! Advanced booking essential on some services. For all details and tickets, click here . P class No. 178 is currently visiting the National Railway Museum in York. In this photo she is offering visitors a chance to talk railway safety with a British Transport Police officer, on 26 March, 2018. Fish & Chip Specials are back! For a timetable and to buy tickets for these always-popular trains, click here . Want to add to a celebration? Celebration packs are also available for an extra fee. A montage of iconic Swindon images are shown in this impressionist view of the Railway Town. This includes Moredon Power Station, St Mark's Church, an express locomotive, and the famous GWR Works entrance . That part of a train's power consumption needed to power air conditioning, lighting, heating, and kitchen facilities on a train. 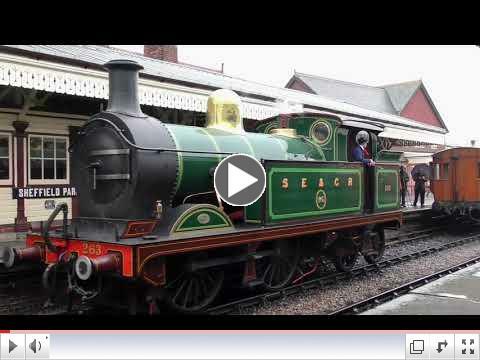 Nick Dearden's video shows steam action at the Railway from autumn and winter 2017/2018. The video features: No. 323 "Bluebell", No. 1618, and No. 9017 "Earl of Berkeley". An 03 diesel shunting in the street , probably at Great Yarmouth North Quay, in the 1960s or early 1970s (exact date not given). There are many photos to interest our readers at this site, and prints are offered. Lance Allen took this photo of "Bluebell" returning home to Sheffield Park on 28 March, 2018, after flying the flag for the Bluebell Railway at Spa Valley recently. Welcome home, Ambassador! The Football Competition March table sees a tie for first place between Damian Smeaton and David Pegg. Not long to go now! The competition is a fundraiser for the forthcoming overhaul of Maunsell Dining Saloon No. 7864. Martin Malins visited the Railway during the 60th Anniversary closure event, and was eligible to ride for 4 shillings. He brought along those shillings (not accepted, but a worthy attempt) and a fascinating old Lewes-to-East Grinstead ticket. Writes Richard Salmon, "The ticket is an interesting one, being routed over two other now-closed lines, but not via the Bluebell, which must have already closed at the time." The locomotive duty roster, with expected duties for April 2018, has been published . Also, don't forget to check out the Today at the Railway webpage for the most up-to-date and late breaking news. Proposal to Close Down The Saxmundham to Aldeburgh Passenger Railway Line (Anglia TV News): The train to Aldeburgh arrives at the platform of Saxmundham Train Station, then continues along the route through Leiston, and arrives at the station platform for Aldeburgh. The latest newsletter from the Standard Class 2 No. 84030 project has been published to the Society website, but to receive it directly, subscribe to the newsletter at this link . This project aims to recreate an example of the last British branch line locomotive, a type that never made it into preservation: the BR Standard Class 2MT 2-6-2. The photo above shows the ever-more complete front of the locomotive. Most of the work in recent months has been associated with constructing a base for the cover over the locomotive, and the track upon which No. 84030 will sit. Please note: Over the weekend of 21 and 22 April , there will be no train service on the Oxted line. Passengers will be bussed to and from East Grinstead and Purley. Join us at @bluebellrailway Horsted Keynes station on Saturday 16th June for our summer party music festival. The excellent live bands on our outdoor stage are guaranteed to get you dancing, you can camp over plus get steam trains to and from the festival all day. @bluebellrailway what a fine way to spend Easter Day! A particularly excellent trip to the @bluebellrailway today. Special thanks to the catering team on board train, the mad hatter's team and the tea hut at Kingscote. A credit to the railway. A year ago minions invited @MrTimDunn to visit my shed to raise money for the 3417 Fundraising effort. It worked. Today, thanks to new friends like @LordScroley and @BJAlbertros, they are still working to bring the last 4VEP back to life. @bluebellrailway never thought I would get excited by being pulled by the Class 09, my wife's words "hurrah for the little guy! ", great day out as usual!